There are various types of small form factor cases available in the market today. It includes mini-ITX tower cases, mini-tower cases, sff cube cases and slim cases. If you want the sleekest and smallest dimension case then you should look for a slim computer case or sfx case. 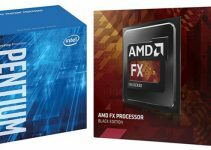 I have written many articles about PC cases in this blog. 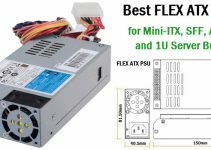 Previously I have listed down best mini-ITX cases, mini-tower cases, mid-tower cases, full-tower cases, cube cases, silent cases but here I am going to list down the best slim PC cases or low profile PC cases for building a HTPC or SFF PC for home or office use. A slim or low profile computer case is narrower in dimension or has lesser width and can accommodate only mini-ITX or up to micro-ATX motherboards. These slim cases also have limited expansion slots and generally you can only fit low profile expansion cards in them whether it is a graphics card, sound card or any other card. These small form factor cases are great for building a HTPC or a normal desktop for work or office where you have shortage of space. 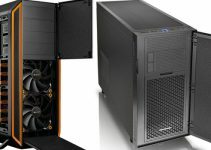 Here are the best low profile PC cases or slim computer cases that you can get for building a HTPC or a small form factor PC for work or home use. You may also call them as SFX cases because of their compact design and most of them require a SFX power supply only. All the below mentioned cases allows you to install a low profile graphics card or low profile expansion cards. Please don’t expect too much airflow in these cases because most of them come without fans and relies only on vents for cooling or heat dissipation. One more thing about these slim cases is that they can be placed in either vertical (tower) or horizontal orientation. 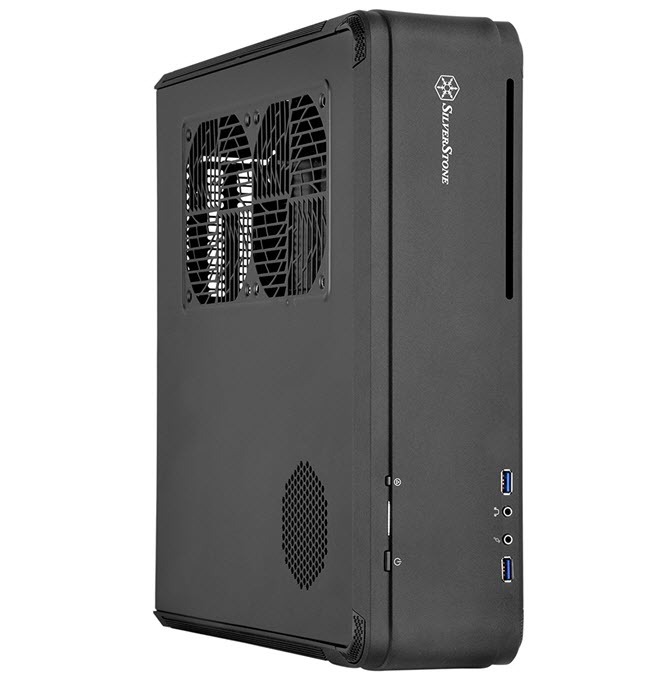 SilverStone offers some pretty good small form factor cases and SFX power supplies. 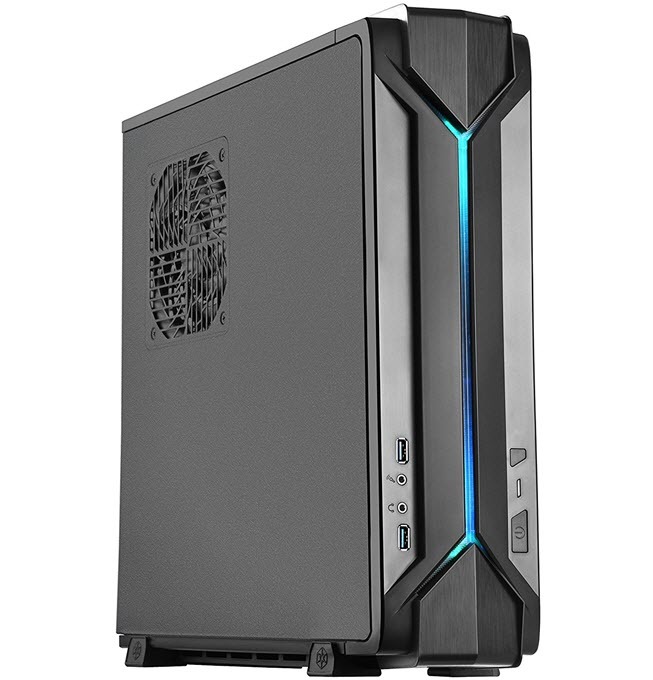 Here from SilverStone we have RAVEN RVZ02 computer case which is a very stylish slim PC case and offers good amount of space considering its size. This slim case can fit a regular dual slot graphics card up to 330mm in length. This means you can fit a decent high-end graphics card in this slim computer case. This SFF case is great for building a compact desktop workstation, console killer PC or a powerful HTPC. It can be placed vertically or horizontally depending on your needs or the amount of available space in your area. This slim case supports Mini-ITX motherboards and SFX PSUs. The cooling in this sff case is passive and it has got exhaust vents at rear and sides. The front part of the case contains two USB 3.0 ports and audio ports. Other features include tool less drive installation and a slim optical drive slot. Overall it is a great mini-ITX slim PC case for building a powerful system for entertainment or work. Highly Recommended by me. This is a powerful and stylish slim gaming case from Thermaltake that can support up to ATX sized motherboards. This SFF case is for enthusiasts and gamers who want a compact and powerful PC for their high-end work or gaming. This slim case offers great amount of space and has good ventilation and cooling. For cooling it comes with one 120mm case fan at front and you can optionally install an extra 120mm fan at the top. This is a Tt LCS Certified case from Thermaltake which means it is compatible with most of the extreme liquid cooling solutions. This SFF case can support 310mm long regular graphics card, 110mm tall CPU cooler, 240mm Radiator for water cooling unit and a SFX power supply. This case is 4K and VR ready which means you can build a fully fledged high-end gaming PC using this case. Also you can place this case horizontally or vertically depending on the space you have in your room. Other features include tool free drive bay design and a transparent window panel. So if you are gamer and want a slim and compact case then you must get this one. The case is also very affordable. Highly Recommended for Gamers. Rosewill R379-M is a classy looking inexpensive slim PC case from Rosewill. This is a great slim form factor case for building a normal computer for work or for a HTPC. 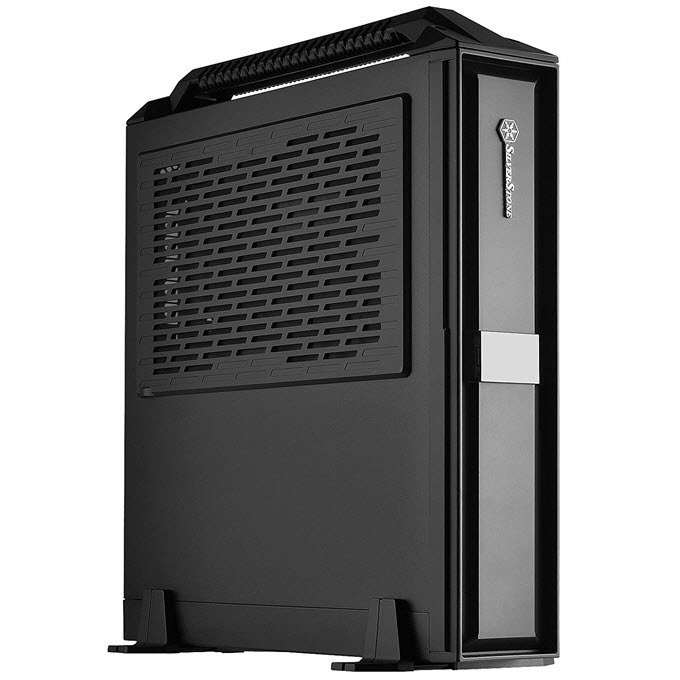 The case can be oriented vertically or horizontally for desktop or tower setup, and can support up to Micro-ATX motherboards. For cooling, it comes with one 80mm fan at top and vents on side panel. The front I/O ports consist of two USB 2.0 ports and audio ports. 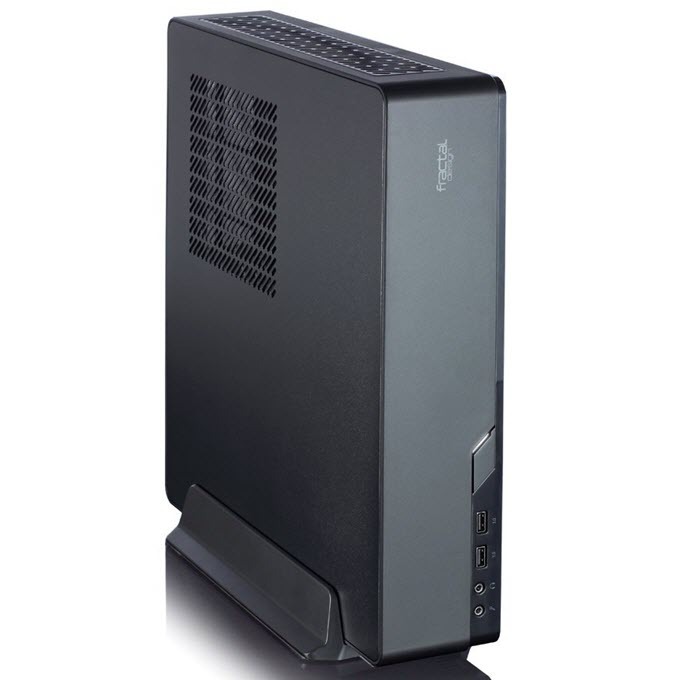 The case comes bundled with a 300W TFX Power Supply which enough for a HTPC or a standard PC workload. The case can fit low profile graphics card up to 198mm in length and up to 80mm low profile CPU coolers. It comes with removable drive cages for easy installation. In storage department it supports one 5.25” and one 3.5” drive bays externally, and one 3.5” drive bay internally. Construction quality of the case is also pretty good and it is Thermally Optimized with Excellent EMI Shielding. So, if you are in search for a budget Slim case that supports Micro-ATX motherboards then this one is definitely worth considering. Antec VSK2000-U3 is a slim computer case that support micro-ATX motherboards. This is a high quality sff case from Antec and is suitable for building a HTPC, desktop for work/home, silent PC or a small server or gaming PC. For cooling the case comes with 92mm temperature controlled fan and on the front and you can find two USB 3.0 ports and audio ports. This SFF slim case can only support low profile graphics cards and a TFX power supply. You can install an optical disk drive in this case as it comes with a 5.25” drive bay. 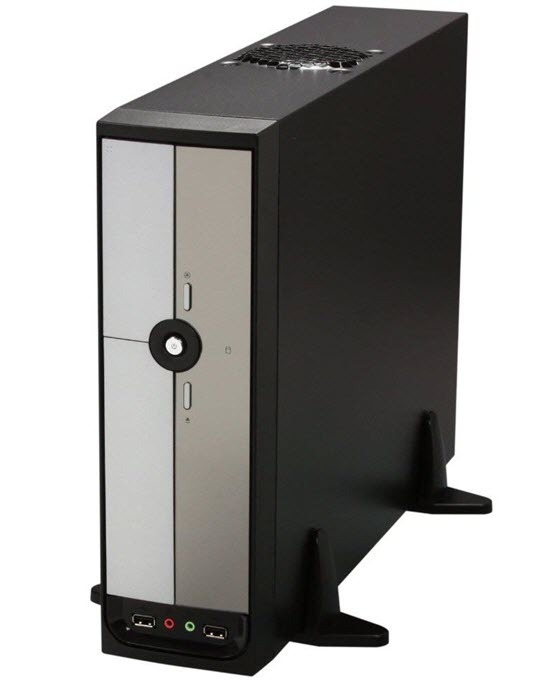 The case can be placed vertically (tower) or horizontally as per your needs. Other features include tool less drive installation and quick release button on panel. SilverStone Milo ML08 is a super slim computer case that support mini-ITX motherboards. This is a very compact computer case but you can build a fairly powerful system with it. This is because this case supports up to 330mm long high-end graphics cards. The CPU cooler limitation is only up to 58mm which is understandable for such a slim case. For cooling this slim form factor case relies only on exhaust vents for heat dissipation. On the front you will get two USB 3.0 port, audio ports and an external 12.7mm or 9.5mm slim optical drive bay. This slim case can be placed horizontally or vertically and it comes with a carry handle on the top which can prove very useful in transporting the case from one place to other. The case supports only SFX and SFX-L PSUs and has got all tool less design for drive cage system. This case is also available in handle less design and you can check that variant too from the link given below. Here we have a very good slim mATX computer case from a smaller brand which is IN WIN. IN WIN CE685 is a modern and good looking slim computer case that can support micro-ATX and mini-ITX motherboards. 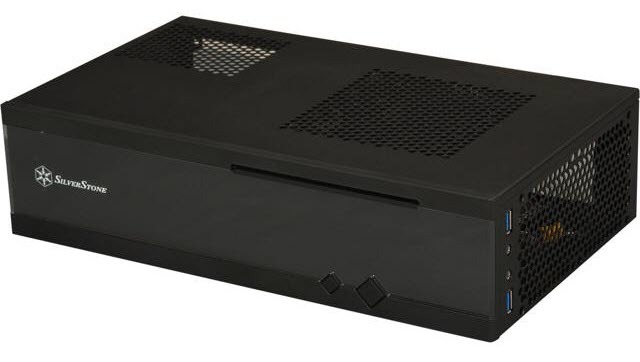 This is a feature rich case and is great for building a sturdy HTPC or a powerful compact PC. For cooling the case comes with one 90mm front fan and on front you can find two USB 3.0 ports, USB 2.0 ports and audio ports. 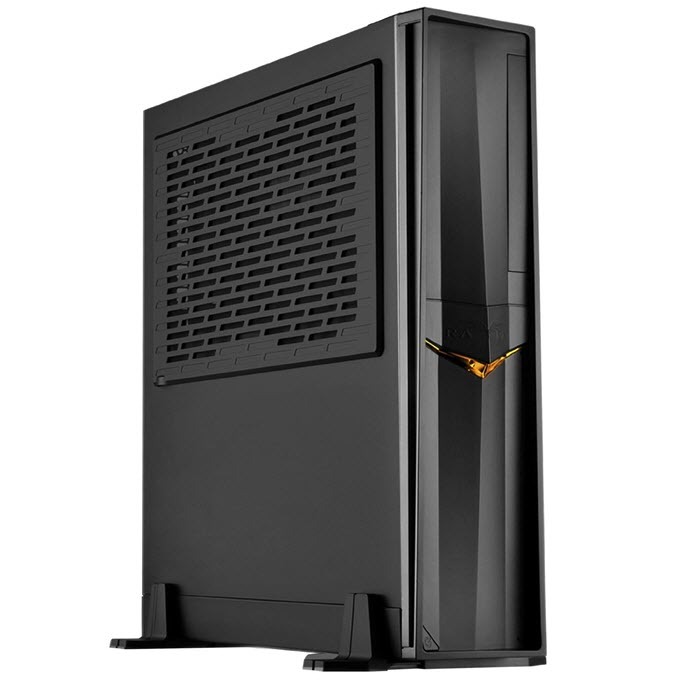 The case has got four low profile expansion slots and it only support low profile graphics cards. 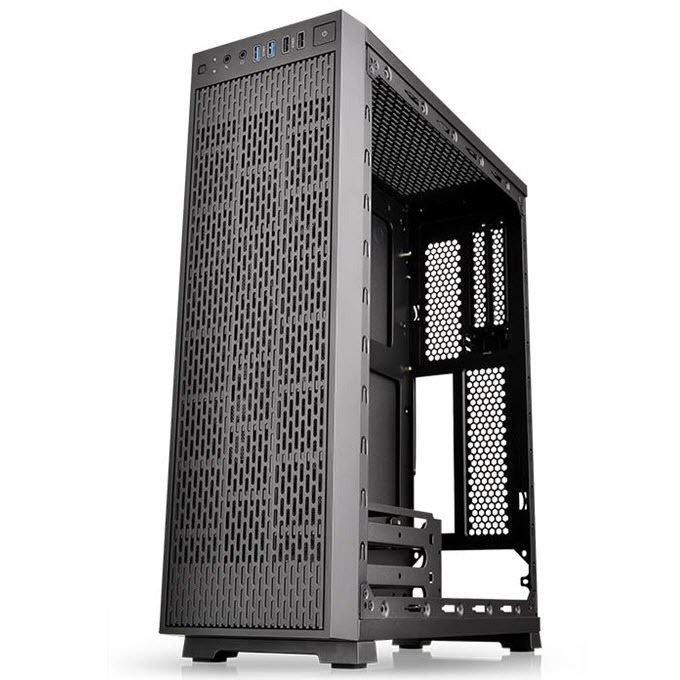 It supports TFX PSU and other features of this slim case include air filter, tool free slide cover, chassis intrusion switch and screw less drive installation. The case can be placed either ways i.e. horizontally or vertically. Overall it is a great slim case for the money. This is easily one of the smallest slim form factor cases available in the market today. This super small case is only suitable for building a media center PC or HTPC. It supports mini-ITX motherboards and for cooling you can install two 80mm fans on right side panel. The front part of the case has got two USB 3.0 ports and audio ports. This tiny case has got only one expansion slot and in that you may install a low profile graphics card or other low profile expansion card. The CPU clearance is around 37 – 70mm. The case includes a Multipurpose 4-in-1 bracket for installing a slim optical drive. This slim case supports SFX PSU and up to four 2.5” inch HDD/SSD. So if you are looking to save maximum space and want a tiny case for HTPC then you can have a look at this one. This is a high-end slim SFX form factor case that supports mini-DTX and mini-ITX motherboards. It can be used to build a powerful compact gaming PC, HTPC or a small workstation. The case has got ventilation and for cooling it comes with custom designed low profile fans for optimal airflow. This is a very good looking case and on front you will find two USB 3.0 ports and audio ports. The case can be used in either horizontal or vertical orientation. SilverStone Fortress FTZ01B SFX case can support high-end graphics cards up to 330mm in length, 83mm tall CPU cooler and 240mm radiator for liquid cooling unit. This powerful slim PC case support SFX and SFX-L PSUs and there is also a slot for adding a slim optical drive. 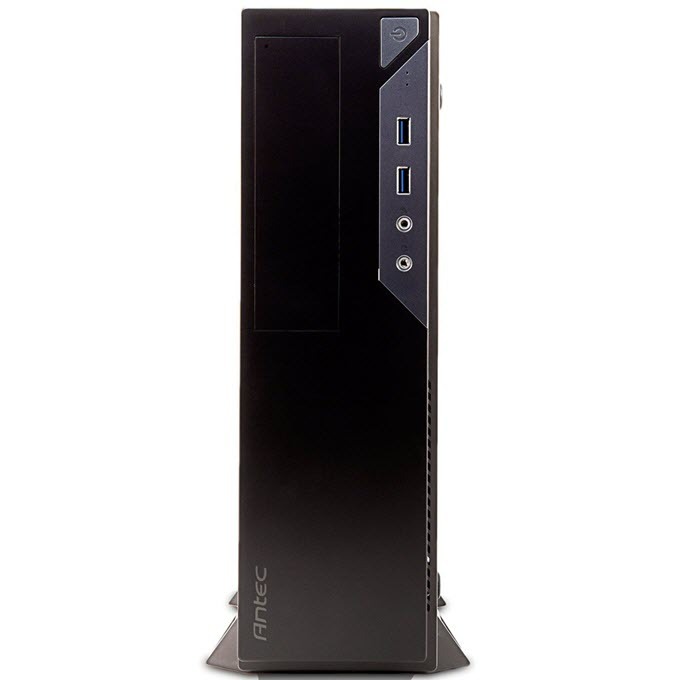 Overall it is a solid slim computer case that has got looks, performance and features. Recommended for enthusiasts. Fractal Design Node 202 is high-end sleek small form factor case that comes bundled with a 450W SFX PSU having 80 Plus Bronze Certification. This is one of the best looking and solid slim cases that you can find in the market. It has extremely small footprint and has volume of only 10.2 liters. It supports mini-ITX motherboards and comes with good amount of features. For cooling you can install two 120mm fans on the front. You also get two USB 3.0 ports on front and audio ports. This is a great case for building a SFF gaming PC or a compact workstation. This SFX case can support graphics cards up to 310mm in length, CPU coolers up to 56mm in height and SFX PSUs up to 130mm long. With this case you can build a powerful SFF gaming PC, compact workstation or a HTPC. The 450W PSU that comes with this case has got an 8-pin (6+2) PCI-E power connector and can easily support a mid-range graphics card. The case comes with dust filters and this slim case can be placed horizontally or vertically. SilverStone RAVEN RVZ01B-E is a slim factor case that looks very much like the SilverStone Fortress FTZ01B Slim Case mentioned above in this post. This is a modern looking and stylish case that offers good airflow and ventilation. For cooling it comes with one 120mm fan on top and one 120mm fan at the bottom. The front panel of the case consists of two USB 3.0 ports and audio ports. The case can be placed horizontally or vertically as per your convenience. This case allows you to install a 330mm long graphics card and a 83mm tall CPU cooler. The main advantage of this case is that it supports regular PS2(ATX) power supply up to 150mm in length (140mm recommended). Overall it is a very good case for building a powerful PC or a HTPC. Highly Recommended by me. Here we have an RGB low profile case from Silverstone RAVEN series which is SilverStone RAVEN RVZ03. This slim case comes with an integrated RGB light strip on the middle of the front panel and its lighting and effects can be controlled using the included Silverstone LSB01 RGB control box or through RGB enabled motherboard. 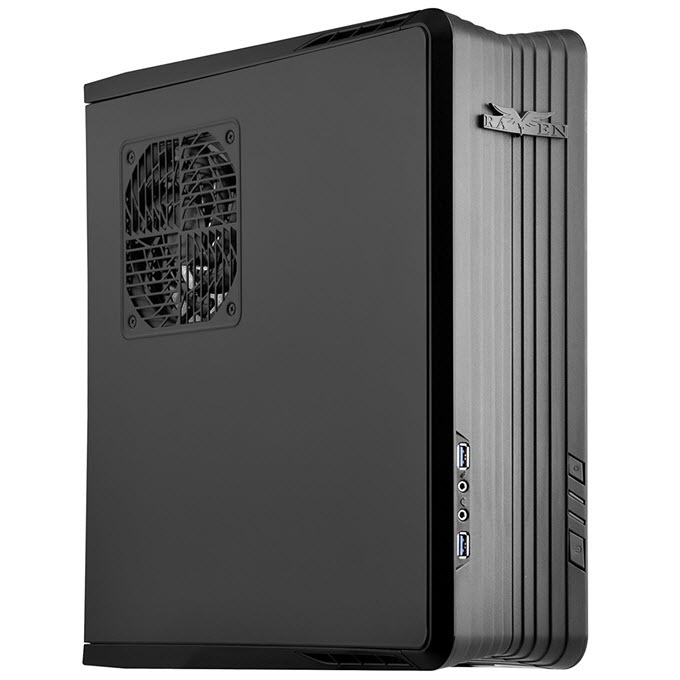 This is a stylish and modern looking case and it supports up to mini-ITX motherboards. For cooling, it comes with one 120mm fan at top and one 120mm fan at bottom. You can optionally install one more 120mm fan at bottom if you want more airflow. The front I/O ports include two USB 3.0 ports and Audio ports. It can support 330mm long high-end graphics cards using PCI-E riser card, CPU coolers up to 83mm in height and up to 150mm standard ATX PS2 power supply. You an install up to four 2.5” drives in this case. The case can be used in horizontal or vertical orientation as per your liking. Other features include Kensington lock and AIO liquid cooling support. This slim RGB case is well built and has all the space, functionality and features for building a powerful SFF gaming PC. At the end I would only like to say that if you have space constraints and looking for a small and sleek case for HTPC or general use then the above mentioned slim computer cases will not disappoint you. 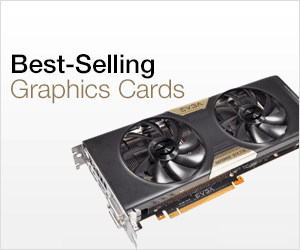 Some cases can even accommodate regular sized high-end graphics card while allow only low profile graphics cards. You can even build a compact gaming PC or workstation using some of these slim cases. If you have any queries regarding them then you can ask me by leaving a comment below.